As many of you know already, I am between jobs. I left my previous job at the end of August and I am starting the next one in October 1st. I am hoping to take this time continue with my quests of "What is the life all about, and how does this relate to surfing?" So I have packed my car last night (Saturday) and start to head towards San Diego and stop by many of the spots on the way to and on the way back from there. The first stop was in Santa Cruz. I tried to find a motel there to stay overnight so that I can do a DP. I had a late start so I did not leave until 11:00 PM or so. My first goal was to find a motel. Actually it was not easy on Saturday night. But I saw a familiar Vacancy light on in one of the motel. I could not read what the outfit was but by now it was close to midnight so I had to find something quick. Have you see the movie "Sideways." Well, the place turned out to be one of the Hitching Post Motels. But this one was really in a bad shape and I got charged $89 a night, comes to be $99 with tax. Anyhow, it was a very old building inside and out. I slept OK, but when I tried to take the shower all the hell broke loose. First the shower did not work. I pulled the thing on the faucet to change to the shower mode and it did not work. Next I tried to take the tub bath, and so I switched the knob to the tub mode and the drain did not close. I stuffed the towel and the emergency patch was completed, but gosh, how these people deserve to get close to $100 a night for such a crappy place! But I don't dwell on things. I have moved on to Coffee Topia near the Hook for a reliable coffee and pasty before checking out the waves. By then it was already 8:00 AM. When I checked out the parking situation, all of the spots were full on top of that the water looked pathetically flat. Of course, I now know Santa Cruz like the "back of my head" so I went on to Manresa Beach, which I consider the spot as one of my home breaks. I have to describe why I like this spot a lot but in short I like this spot because it is a beach break and it really can spread out. A savior on crowded day in Santa Cruz, and my surf training is on crappy beach breaks, so I actually tend to enjoy this type of break. But look at how clean it was braking this morning, and my Xanadu Rocky brought me some good rides! The only problem is the red tide and the water was definitely all red-brown. Right now, as I write this, I am now bit suffering from the stuffy nose! 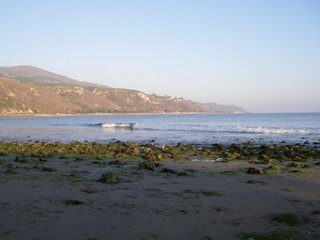 But then this is a surf trip so I am going to live with it. Hopefully this will clear as I surf further south. The next destination was Rincon and Ventura, so I headed south on US101. I have been on this route so many times on surf trips that I really feel at home driving this route. I can actually say that the entire Califronia coast is kind of my home break, since I have really surfed so many places on the map, stayed there and got to know the towns. Right now, I am writing this at a cafe in Capinteria, which is a town south of Santa Barbara. When I arrived here, one of the first thing I wated to do was to get a spring suit. Or at least I thought I needed it. I jumped into a surf shop and the guy there told me that water is so cold that he surfed today with his 4/3. Good info. I got to save some money. After taking a bit of nap at a motel, I headed out to Rincon. It was flat! Check out the picture 2. 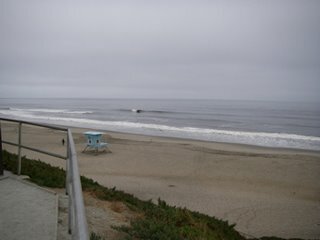 Tomorrow morning, I will check out Ventura breaks and if that is not working out I am going to head straight to San Clemente. Your first two pictures are in reverse order of your trip description. Steve, Thank you. I corrected them. I was in kind of a hurry because I was at a restaurant that was closing for the day.